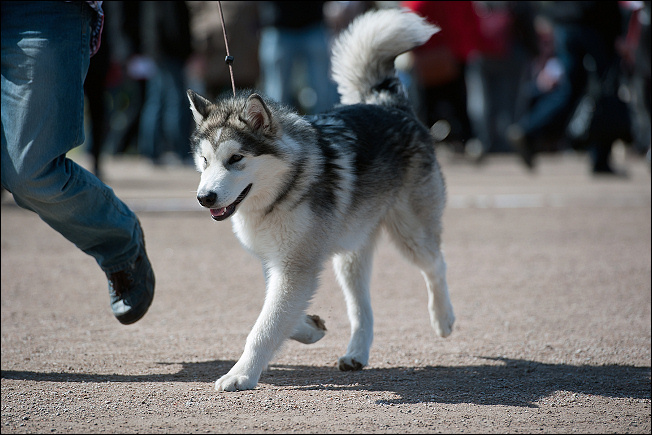 Finnish Alaskan Malamute Specialty Show was 19.1 at Tampere. I had entried Leevi, Yazhi and Yepa of our mals. Leevi was in Baby class (5-7 months), where he was 1st. I noticed, that he obviously need some ring training. Siida (Tsaani Shida Tifmiruq) was entered in Junior Class. Siida didn't like much showing, and she got Good from Jun class. She also needs time to develop. Yazhi was in Open Class and judge did like her and especially her movements. Yazhi's result was Open Class Excellent/3rd and she also got CQ. Yepa was in Working class, almost totally out of coat and way too wild! :) She did howl, jump and almost run me over, but still she got Very Good and was 3rd. I also did show my offspring Yupik (Tsaani Hey Tipviqut) in male's Open Class. Judge also did like Yupik and his movements and his results was Open Class EXC/2, CQ. Judge was Paavo Mattila from Finland. 26.1. was official Weight Pull test at Ohkola. Yaykaas and Yazhi were entered there and it was Yazhi's first time ever. This time she did pull only starting weight and nothing more, but Yaykaas got his first official result KVK1. 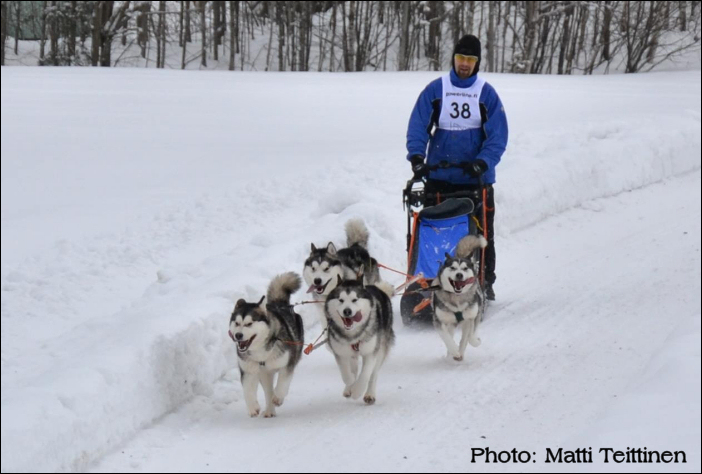 Our team participated also Sled dog race at Kasari, 3.2.2013. Distance was 2 x 6,5 km. In our team ran Yona, Yaykaas, Yazhi and Kayitah. Kayitah didn't get official result, because he was 2 weeks too young to get it (15 months), but our team got official result REK3. That was Yazhi's first working result. Season's second weight pull test was at Kouvola, where we had entered Yazhi and Yona. Yazhi did pull two times, but then she didn't pull official result demand, 5 x own weight and didn't got official result. She obviously need some training for working alone, she obviously was thinking where is the rest of the team. Yona did solid work and was 2nd in test, right after her brother Talut. Yona's result was 321 kg / 11,26 times her own weight and of course title KVK1. I have also got happy news from our offspring. Siida and Kayitah were eye checked and both were healthy of their eyes! 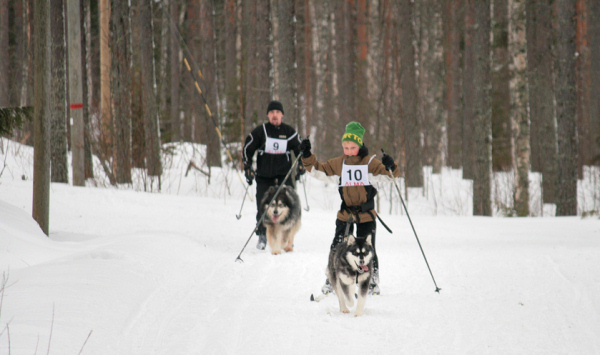 Kaapo (Tsaani Shida Nuqitkaa) got his first official working result at Ohkola two day race 16.-17.2.2013. Kaapo ran in Rami's team with Siku, Manu and Nera. Team's result was REK2. 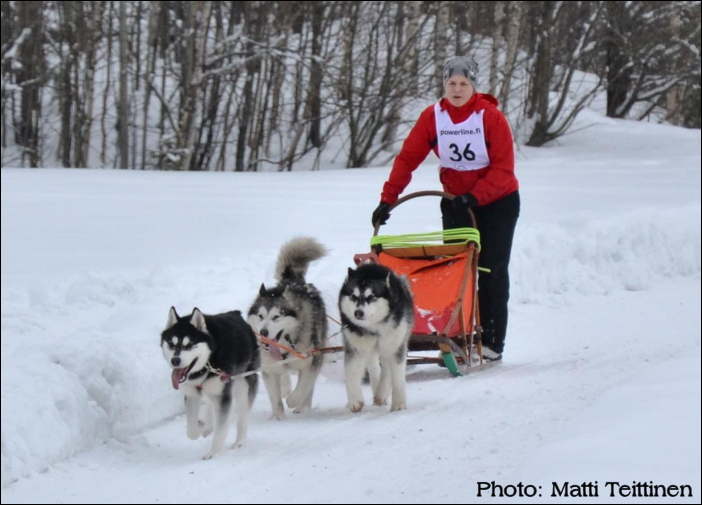 Kaapo was also at Finnish Alaskan Malamute Club's winter meeting and participated to 9 km sprint race with Siku. Also Siida (Tsaani Shida Tifmiruq) and Yupik (Tsaani Hey Tipviqut) were at Ohkola race in Sini's team, this time official result didn't come, but they got important experience. Tika (Tsaani Hey Qilaq) has participated in SOC-race in Jokke's team. 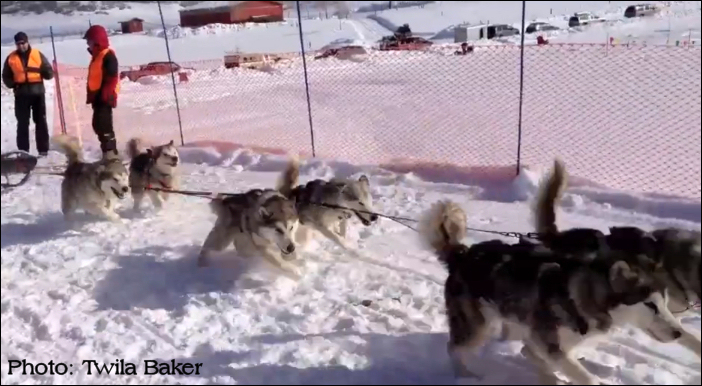 In three day sprint race wasn't official Sled dog race test. 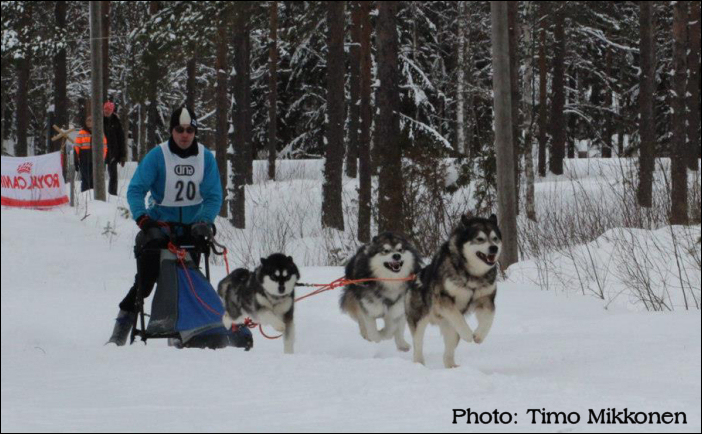 Tika also ran in Jokke's team at Finnish Alaskan Malamute Club's winter meeting in 21 km MD-race, they were 4th. Also sad news has come. Leevi's sister, Lissu died in february to stomach rotation. Also Yazhi had emergency surgery due to foreign item at her intestinals. Piece of dog toy had been at her stomach over 5 months and at Thursday 7.3 it went to her small intestine and block it 100%. 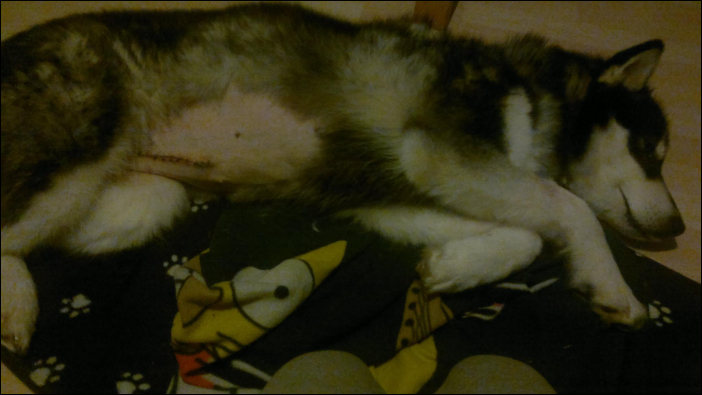 Right after the surgery, Yazhi's stomach bloated, but vet managed to tube her and got the gas out. Last two weeks has been quite hard, because first week Yazhi didn't eat or made her feces. Now she's getting much better, eating and makes her poops. Stiches are removed next Monday.. 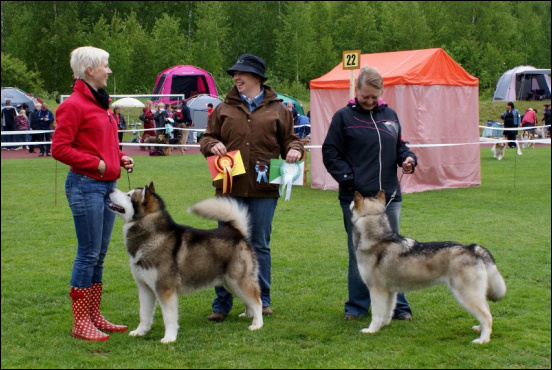 In Finnish Alaskan Malamute Club's competition Best Of The year 2012, our mals were placed quite nicely. 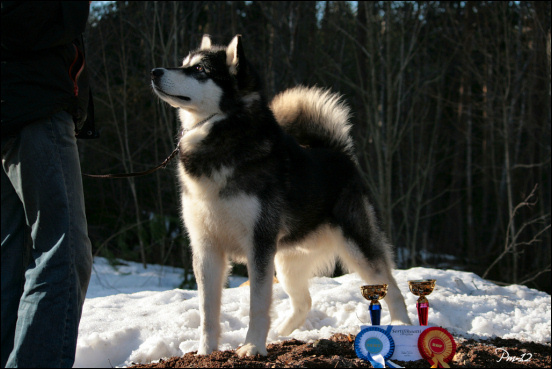 Best Activity Malamute 2012 our Yona was placed 2/16, Yaykaas 3/16, Yepa 10/16, Yazhi 11/16, Hino 15/16 and Kayitah 16/16. First place went for Timi, our Shida-litter's sire. 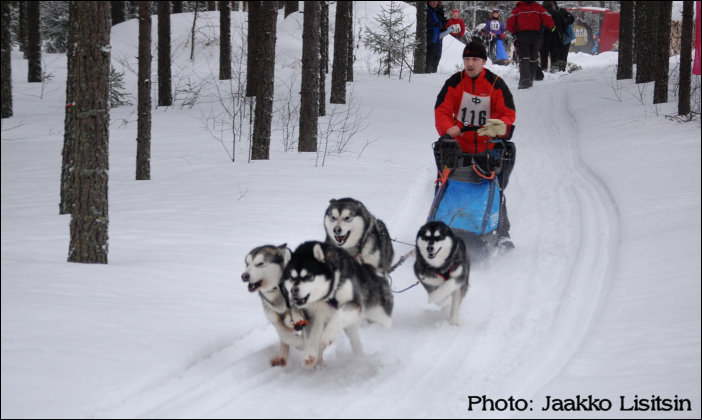 Best Sled Dog 2012-competition was Yona 4/14, Yaykaas 5/14, Yepa 8/14, Yazhi 10/14 and Hino 12/14. I have updated some photos for Leevi and text updates for Yaykaas, Yazhi, Kayitah and Siida. And last, some puppy things... There is approx. 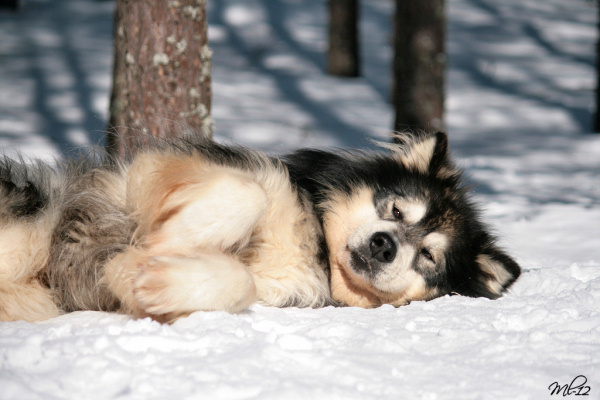 30 coming/planned malamute litters in Finland this year, which is, in my opinion, way too much for our country. For this and among other things I have decided to change my plans with Yona and change my litter plans for the next year. I'm planning very interesting litter for Yona with Swedish working male. More about that later. 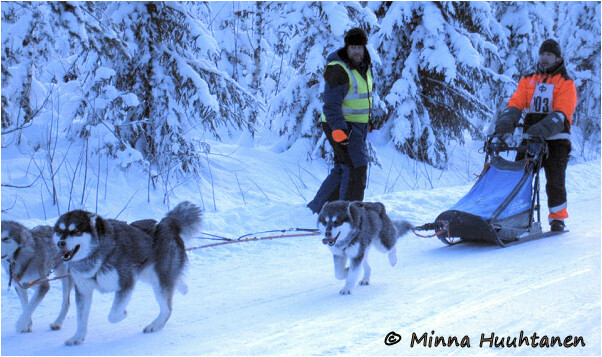 Last weekend we were giving sled ride for young swimmers from team Lappeenrannan Uimarit. Rami and Minna were also with us with their own team. Day was really fun for swimmers and also for us. It was nice to see, how well our dogs performed, even though it was same short round again and again and again. In our team were Yona, Kayitah, Yepa and Hino, and mascot Leevi. In Rami's and Minna's team were Sade, Siku and Kaapo from our Shida-litter. Once again one year is ending and new, exiting year is just about to start. Last year has been very busy and full of changes for us, but also brought many lovely things. 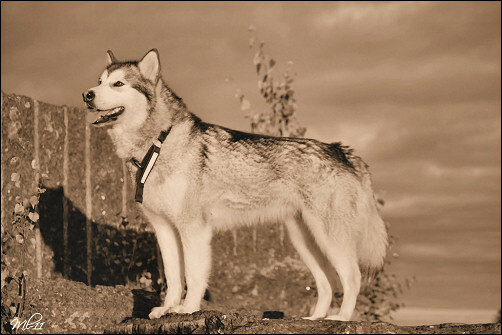 We wish Happy and prosperous New Year 2012 to all of our friends, offspring owners and to all malamute people! Last year this day was kennel Tsaani's first official litter born. Yona's and Timi's lovely Shida-puppies. Kennel Tsaani wishes Happy Birthday for all young adults: Kaapo, Voitto, Siida, Suuri and Kayitah! 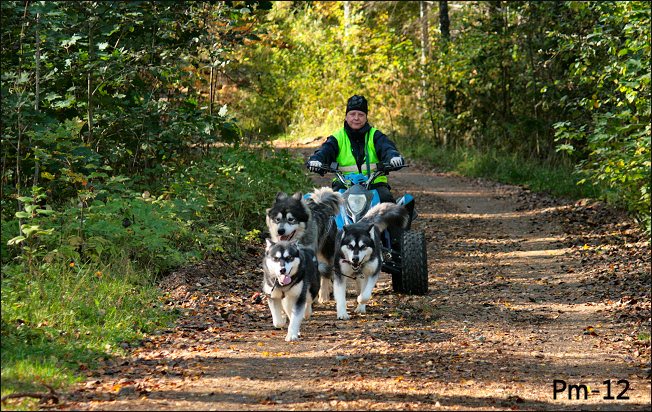 Last weekend we were at Hilikkula, Rokua with all our best malamute friends. Our intention was to train dogs together and have small "before christmas" night. Weekend was really, really nice, food was very good and it was really fun to train dogs together. We also got our new baby, Leevi home from that trip. Leevi's official name is Utamuutin Bob Younger and he is born 17.7.2012. Leevi's dad is our Yona's brother, lovely Talut (FI CH Cahppes Knight Of Naxxar REK1 KVK1) and dam beautiful import from Canada, Awa (FI CH NO CH Silverdream's Heart Melody REK1 KVK1 WTD). Leevi is co-owned with his breeder, Sari, who owns 1/3 of Leevi. At Hilikkula, I also met Siida and Yupik & Tika from our Hey-litter. It was really nice to meet them all! I'm very happy especially of Siida, who has developed very nicely. She is still happy and energetic girl, like when she was little. 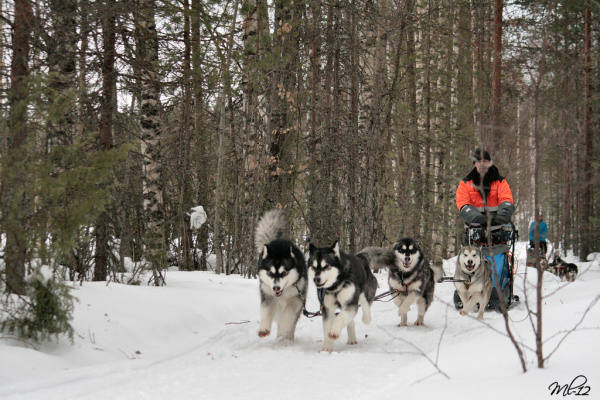 Added new photos to all gallery albums, added new link to link-page: Pure Sleddog-site. Autumn training has started slowly, Pekka's back surgery has made it more slower than normally. But we have finally finished excercise fence on our yard, so mals can run freely there, even though training isn't so continous right now. 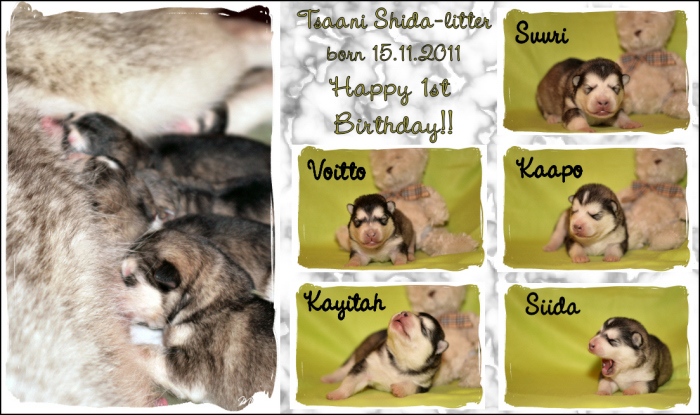 Tsaani Hey- litter had 2 year birthday on 11.9.2012... Happy Birthday Kassu, Yupik, Tika, Illa & Yazhi!! And last but not least... I reveal a little secret: Kennel Tsaani is planning a new litter next spring, but more info will come later! Last show for a some time was last weekend at Kangasniemi. Only Yona was entered there and our hope was to get last CAC for her, which would make her Finnish Champion. Yona was showing herself nicely and got Excellent from Working class and was placed first in class. She was also Best Female, got CQ and that last CAC! Now she is FI CH NordJW-09 Cahppes Miss Qrendi KVK1 REK1!! In BOB-ring she was placed BOS. I'm SO happy!! Judge was Kirsi Honkanen from Finland and she gave following written critique for Yona: " Good proportions. Excellent gender. Correct head profile, good eyes and ears. Winter nose. Beautiful neck, good topline and tail. Good ripcage, excellent bones. Good angulations, brilliant moves. Good coat quality, delightful behaviour." 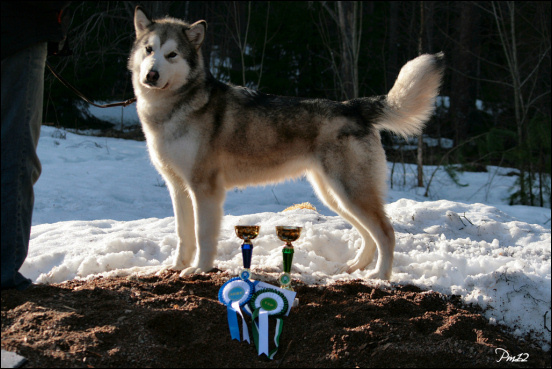 Now all of our over 2 years old malamutes are Finnish Champions, except Hino. Of course they all have also working results and titles from sledding, carting and weight pulling. Some other happy news too: Yupik (Tsaani Hey Tipviqut) has been officially eye-checked and he has healthy eyes! Thank you Sini for taking him to check! All Hey-litter offsprings are now checked healthy of their eyes - great!! Spring and shows - shows and champion... Couple shows done, first was Hollola 1.5.2012, where we took Yona and Yaykaas. Judge was Esa Ruotsalainen, who gave only VG to both. Yaykaas' judgement: "Male, who gives slightly slender and airy impression. Lightfeatured head, would hope stronger body and bones. Balanced angulations, good tail, coat changing. Moves with long and powerfull gait, performing vigorously, nice temperament. Attitude towards judge: Typical for a breed when approaching." After judgement, judge said, that he is absolutle sure, that Yaykaas is great working dog. Result for Yaykaas Working class Very Good / 1. Yona's judgement: "Lightfeatured female, expressionate, light head. I would hope stronger body and bones. Good tail, balanced angulations. Balanced movement, but I would hope slightly more power to her step." And result was same as Yaykaas - Working class VG / 1. 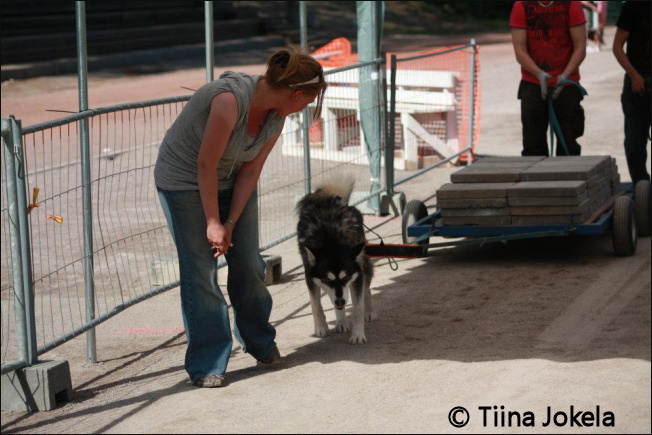 6.5.2012 was Lahti FCI 5-group show and in same place was also Puppy Show. Both Yona and Yaykaas participated to Group Show and Kayitah for his first show in Puppy show. Judge in Group Show was Marianne Holm. In her opinion, Yona should have got everything a little bit more... Yona's judgement: "Feminine, correct type and proportions, but I wish everything a little bit more. Excellent head, slightly noble neck. Good front, body should be broader. Balanced angulations, good boned legs for her size. Good tail, effortless movement. Attitude towards judge: Typical for a breed when approaching." Yona's result was Working Class Excellent / 1. Because of Yaykaas loosing his coat almost totally, we didn't expect much of him, but we were about to be surprised... When we entered to ring, judge asked where we did left his coat. :) Yaykaas' judgement: "Excellent type, correct proportions. Good head and expression. Good neck, "spacious" body. Excellent bones and paws. Good tail. Balanced angulations, effortless movement. In summer coat. Attitude towards judge: Typical for a breed when approaching." After giving critique, judge said that she imagined full coat for Yaykaas when judging him and then he is perfect! Yaykaas' result: Working class Excellent / 1., CQ, CAC and that last CAC made him also Finnish Champion!! In BOB-ring Yaykaas was BOS with judge saying that he should go home and grow some "wool-pants". Thank you judge Marianne Holm for really nice critique and humorous ring experience! In Puppy Show malamutes were judged by Unto Timonen. In same ring with Kayitah was also his brother Kaapo (Tsaani Shida Nuqitkaa). Both boys were showing themselves nicely and got very nice written critiques. 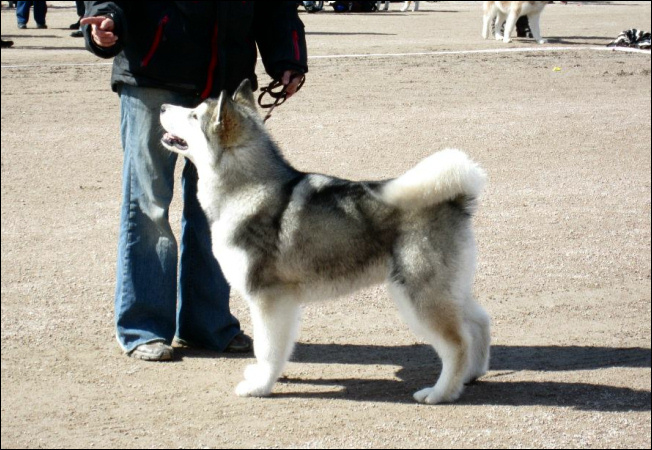 Kayitah was 5-7 months males 1st and Kaapo 2nd. Both also got Prize Of Honors. Kayitah was 2nd in total male puppy competition, older puppy was BOB. Kayitah's critique: "Strong bones, good sized male puppy. Excellent head, good expression, strong neck, excellent front and body. Good legs and paws. Good topline, well angulated rear. Moves excellently for his age." Kaapo's judgement: "Good size and proportions, good head's profile, strong neck. Good fore chest, good legs and paws. Well formed body for his age, good topline, good thigh and hock angle. Moves well." I'm VERY happy for both of their results and critique - I like them too! Spring has come slowly and our plans to participate off snow-races went wrong, because race dates were changed. Also our kick-bike went broken, but luckily we have our atv to keep on training. 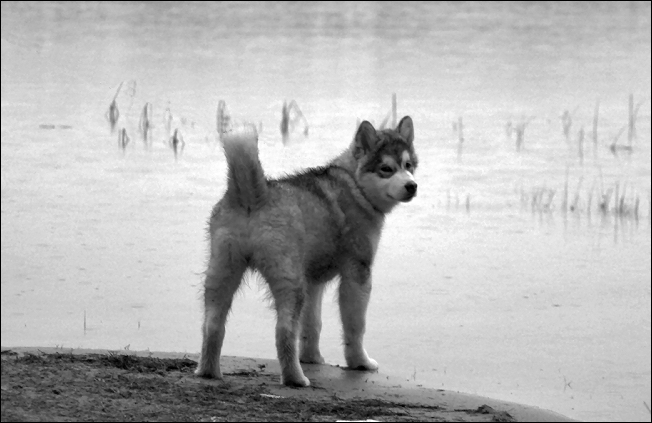 13.4. our first malamute, lovely lady Yepa had her birthday - already 6 years! Tsaani Hey-litter's Kassu (Tsaani Hey Kaskae) has been in official eye examination and he has healthy eyes! Thank you Ritva and Timo for taking him to examination! Oh, and Suuri has finally flown to Usa to meet his "gramma" Twila and starting there his sled dog life. Good luck, Suuri!! Kayitah is growing fast and he is already same height than his mom, Yona - approx. 58 cm. In last weighting he was 24,4 kg. Teeth and coat change has gone well and Kayitah is such a happy and energetic young boy. Below is photo of Kayitah, at the age of 5 months. Once again time has been running fast and winter is starting to turn to spring. Many events has gone, Äkryn Ähellys, Finnish Alaskan malamute Club's winter meeting, official Weigth pull test, Ruunaa race and malamute meeting at Ylämaa. Also one show went by. But let's start updating with Äkry race test, where we were supposed to participate. Once again too few malamute teams was signed to a test and it wasn't enough to keep official race test so it was only a race. In our team ran Yaykaas, Yupik, Yona and Yazhi. Race was sprint and distance was 2 x 8 km, which our team cleared out nicely. At Äkry was also time to Suuri to go with Anne to Kempele and during spring, he is going to fly to USA to Twila's place. Winter has been quite odd with snow- and temperature conditions regarding official Weight pulling tests. Yaykaas was signed in to Kouvola official weight pull test, but it was cancelled due lack of snow. At Kiuruvesi should have been two day test, where was Yaykaas and Yepa signed. Both of tests were cancelled due too cold temperatures. They tried to re-schedule those test couple weeks later, but then influenza hit to people and test was once again cancelled. 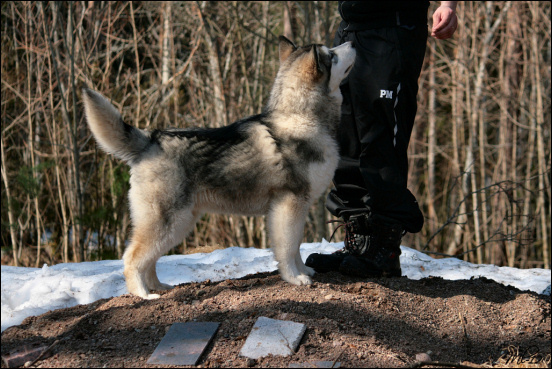 Finally one test was at Finnish Malamute Club's meeting at Rautavaara. Yaykaas was little bit confused of new situation and didn't get official result. Yepa on the other hand got one more KVK1-result, even though she hasn't been pulling weight last two years. Finnish Alaskan malamute Club's winter meeting was 8.-11.3.2012 at Rautavaara, Metsäkartano. Boy, it was fun - once again!! 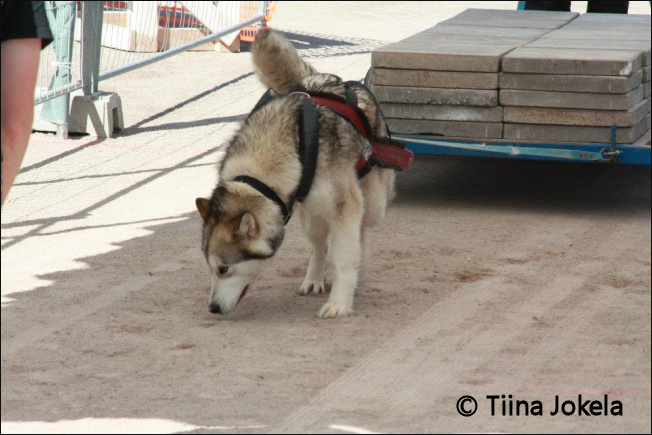 In Friday our 5-team participated to a 22 km race and was fastest malamute team in 5-8 dog class. In our team were Yupik, Yona, Yazhi, Yaykaas and Yepa. Hino was baby sitter for Kayitah. In Saturday Tony participated to a 3 km dog ski class with Yazhi and Pekka with Hino. Yazhi and Tony were both first timers at dog ski, but they were awesome together, even by-passes went really well and they were placed 6. in competition. Tony participated also to kid's sledding competition with Yona. In Sunday was "legendary" weight pull competition. We had four mals participating - Yona and Yaykaas for a first time, Hino second time and Yepa third time. Hino did new record for himself by pulling 250 kg, which is 6,33 times his own weight and we are really happy for his performance. He could have pull even more, but we decided to leave the competition after his third pull because he was so happy for that result. Yaykaas did well also in competition, by pulling 280 kg, which is 9,33 times his own weight. Yona surprised us and pull 460 kg, 17,36 times her own weight!! Really well after having puppies only 4 months earlier. Yona was placed in 4. in total competition and 3rd best female. One more proof about her versatile working abilities - Great! Yepa was also very good as always. She did pull 500 kg, 18,52 times her own weight, which is only 0,28 times own weight less than her personal record. By that amount she was total competition 3rd and 2nd best female. We are so pleased all of them! At Metsäkartano was also other Tsaani offprings: Tika from Hey-litter and from Shida-litter Kaapo, Siida and Suuri. Next weekend was Ruunaa Race, where was mid-distance race. Because Pekka's back was in bad shape, he didn't participate to race, but decided to go to touring class. Also Marko, Anne and Jokke drove that 30 km touring class with Pekka. Yona started her heat and in first day she was left out of our team and only Yepa, Yaykaas, Yazhi and Yupik started. Second day's run was Yaykaas left out and Yona got his place in our team. Also Tika (Tsaani Hey Qilaq) was running, in Jokke's team and she did really well both days. I'm very pleased Hey-litter's working ability! Ruunaa is very beautiful place with awesome trails and for sure we will be there also next year! 24.3. Yazhi was participating FCI 5-group show at Kerimäki. She did drop her coat off before show and result was "only" Good and nothing more from judge Esko Nummijärvi. 25.3 was malamute meeting at Ylämaa for near by malamute owners. Weather was awesome with sunshine and few degrees below zero. 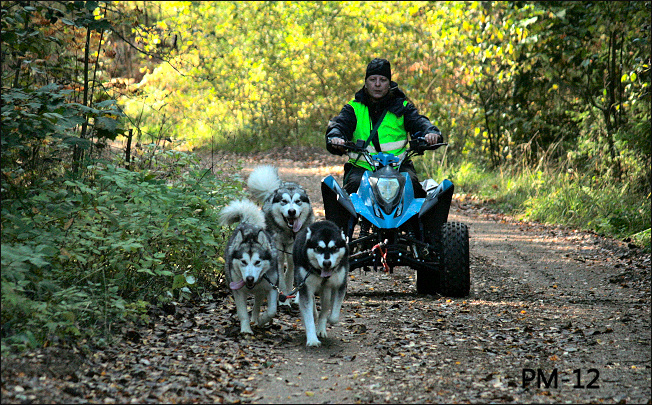 It was really nice day, with new and old malamute owners and their mals. There was also over 10 puppies present and they got to run free and play with each other and had a blast! :) Also Kassu from Hey-litter was there (Tsaani Hey Kaskae) and was really nice to see him since he left to his new home. From Shida-litter there was Kaapo (Tsaani Shida Nuqitkaa) and Voitto (Tsaani Shida Saffiruq). Winter season is almost over and sleds are going to be stored for a summer. Snow is melting fast and it's almost time for Off snow-equipment before we all are having well earned summer holiday! I have added photos for all of our mals, also new photos in Hey-litter's gallery and Harrastus-album. New photo-albums for Shida-litter, Kayitah and Siida. 5 years old Hino enjoying spring sun! Race season has been started. Not the distance, which we were planned (MD), but sprint race. It was supposed to be official sled dog race test, but too few Malamute teams and it was only race. But anyway - we wanted some race experience for Yazhi and that we got at Kasari Salpasäpinät, 4-dog class. Distance was 2 x 6 km. First start's time was 0:21:52 and second start went in time 0:27:03. Second round took more time, because Yazhi went down in icy trail and tangled her front paws to neckline and it took time to get it clear. By-passes went well and dogs were eager to go. In lead was Yaykaas and Yona and in wheel Yazhi. Yazhi went to eye check 26.1.2012 and vet Jaana Pätilä checked them healthy! In Hey-litter all girls are now officially checked clear of their eyes - I'm very happy! 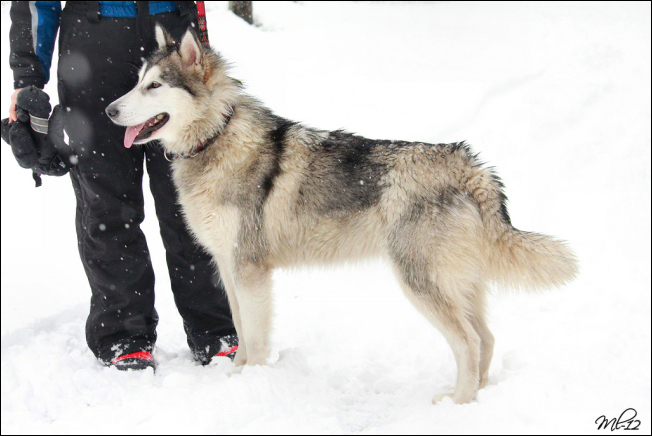 We also met Kaapo (Tsaani Shida Nuqitkaa) in Kasari, who came to visit us with his owners Minna and Rami. Kaapo clearly did remember us and tried to climb to both of our laps :) Below photo of Kaapo in my and Pekka's lap. One male stayed at home, Kayitah, of which we hopefulle will have good addition to our working team later. Kayitah has also own page, which can be found at our Dogs-page. Also Siida, our placed female's page can be found there too. I have been updating pages around, Hey-litter have some health results and so on. Tika and Illa were at eye examination in December and they both have healthy eyes. Great news!! Thank you Jokke and Jone for taking girls to health check! 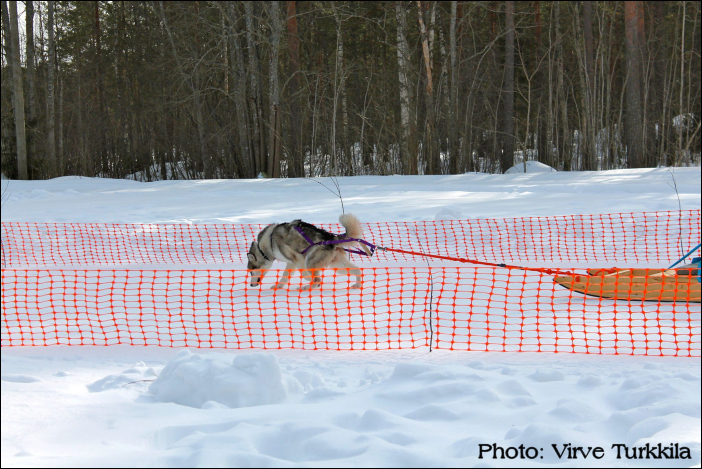 Hey-litter have got also nice working news, Yazhi and Tika were participating for Alma Karelia Challenge-race last November. 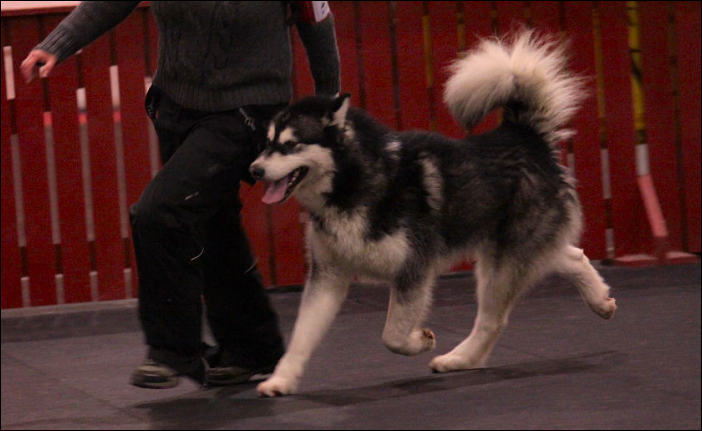 Yazhi took part to junior cani-cross class with Jere and they were second in total competition and first in malamute championship. Tika took part to 2 dog carting class with Jyry and their owner Jokke and they were 6th in total competition and 3rd in malamute championship. 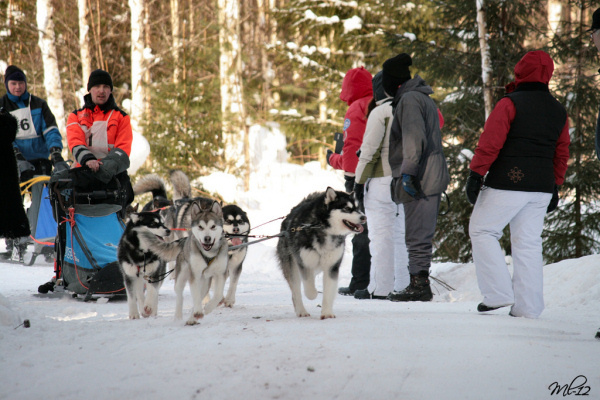 Yupik is doing great job in Sini's team's leader and he has also ran with our team twice. Yupik is really great and promising worker! Kassu is working with Ritva and Illa has been training with Talut (Yona's brother) couple times. I want to thank their active owners! Hino's sister, Kiibu have puppies in kennel Neatut. Congrats! Yona's and Timi's puppies are born! They were born in 15.11.2011 and there is 4 males and 1 female in this litter. You can follow their growth and life in puppy blog, HERE. All puppies are doing and growing well. Yona has shown to be great mom and takes good care of her puppies! All puppies are spoken for. I have also added couple new photos of our mals, to each of their own photoalbums. Added also couple new photos to Hey-litter's album. Summer has gone in very warm temperatures and all our mals have been relaxing during summer. Now we have started autumn training with our own 5-team, little by little. Finally Yona has started her heat and our puppy-plans went ahead a little. We are waiting Yona to be bred in early September. Kennel website is finally ready. Please feel free to look around - hope you'll enjoy yourself in our virtual home. We are planning litter this year for you Yona, PMJV-09 Cahppes Miss Qrendi REK1, KVK1. More info at Puppies-page.